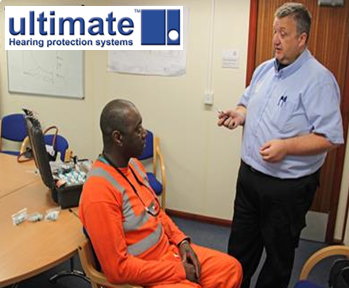 ultimate are meeting this requirement with a 14 lead time on all orders. From initial expressed requirement to initial roll-out was less than one month which included initial user acceptance trials. BBMV required their hearing protection to deliver passive protection in a high noise, contained sub-terrain mining environment, they also required those with two-way radio comms to not be impaired but experience enhanced by the use of the hearing protection. The fit of the hearing protection had to deliver a secure fit and comfort throughout the 12 hour shift. It also had to ensure that the fit and use did not impair the existing personal protective equipment being worn, which included helmets, safety glasses, respiratory masks and air-fed masks and was resilient and robust to operate in a extreme construction environment in terms of both noise and dust and especially in terms of handling the hostile environment of spraying concrete, the process used to line the tunnel walls. Initial trials tested the products met all the above requirements prior to a planned roll-out to all staff. Trial teams were identified and trials run in accordance with BBMV’s own best practice for product assessment. Once initial requirements were being met, BBMV looked further at how our products could enhance the safety aspects of their mining operation. Specifically the close-coupled operation of mining where an engineer is remotely directing a driver-technician on a drilling/excavating job, in this extreme environment of dust and noise the need to deliver detailed instruction to the driver was critical to operational success plus the need for both to operate in a hands-free situation. For this ultimate delivered an in-ear solution with a microphone in one ear and a speaker in the other combined with the hearing protection, a voice activated operation was achieved allowing the operating to crew to focus purely on talking to one another almost ‘ignoring’ the fact they were wearing hearing protection and comms and were isolated from each other except through their comms. Feedback received was hugely positive and the trial teams described it as having completely normal levels of communications as if standing in a room talking normally to each other. Such was the positive response to the trial, John Clifton, Tunnel Agent and Person in Charge at C510 Project described it as the solution they had been looking for in 8 years of research. As a direct result of our domain experience on the tunnelling construction London Crossrail projects, BFK who were awarded the C300 & C410 ‘Western Tunnel’ Projects instructed Ultimate Hearing protection to provide a programme of custom hearing protection roll-out for both passive protection and hearing protection with comms, a similar logistical undertaking servicing multiple sites and multiple shifts followed and continues to date.